Until fairly recently, The Cherry Tree on the A6 in Blackrod was a tired looking pub with a pretty thatched roof. For as long as I can remember it was called the Thatch and Thistle. I remember seeing a man jumping over a bonfire there when I was about eleven, and I think we once had a pretty shoddy meal there about five years ago. Saying that, I had also heard from a relative that they did a cracking funeral buffet... (mental note to self to avoid at all costs). Alas. In 2010 Paul and Catherine Taylor (previously of the Yew Tree in Anglezark) took over. After a swift face lift the dingy pub was given another chance. 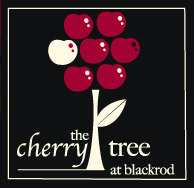 Its name was changed back to The Cherry Tree, which was the original name given to the building, and the menu was completely overhauled. 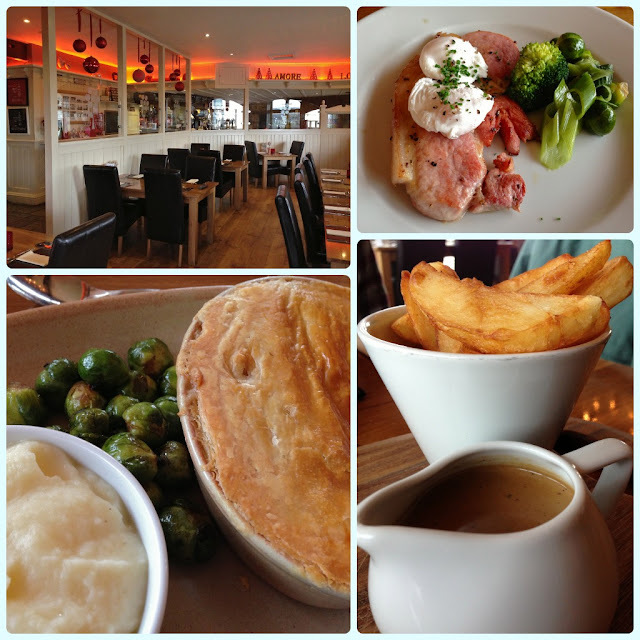 We actually went when it first opened, and whilst the food was decent, we felt they were still 'settling in'. We were huge fans of the Yew Tree in its heyday. In our early twenties we used to go there for a special treat. My husband was a really fussy eater back then, and I remember it being a jaw dropping moment when he tried black pudding for the first time from their Valentine's menu. The Cherry Tree's menu is much more relaxed than the Yew Tree ever was, offering the type of English fayre that my dad and Vicki's mum would approve of; pies, gammon, fish 'n' chips and hotpot. However, they also have some modern local favourites like game terrine and black pudding scotch egg. We decided to return to the Cherry Tree over Christmas. We took my husband's grandma, because she wanted to see what they had done with the interior. It was an ideal choice as it wasn't a long drive and we knew the food was at least half decent. I have to say I was very pleasantly surprised indeed! My husband and his grandma both opted for the gammon with poached eggs, greens and chips and I had the festive turkey and ham pie with celariac mash and sprouts. The gammon was thick and not too salty and the chips were crisp and fluffy on the inside. The peppercorn sauce was the best I've had in a while! My pie was fantastic. A beautifully creamy sauce with large chunks of turkey and ham. The celeriac mash was a touch of genius, as its fresh taste was less stodgy than the traditional sort. The sprouts were pan fried in butter so had lovely little crispy edges too. I couldn't resist. For dessert I had Christmas pudding. In my defence, I hadn't actually eaten any at this point! It was served with a warming cinnamon custard. Loved it. What I loved even more was the fact it should have been served with brandy sauce, but they let me swap it after I saw the word 'cinnamon' elsewhere... Audrey had the same, although she had the brandy sauce... the lush. My husband had the Bakewell tart. I had been hovering over this myself, so was quietly pleased when he picked it. It meant I could steal some... Although the edges were slightly overdone, it didn't really matter as the centre was perfect. Again, this should have come with chantilly cream, but he swapped it for ice cream. God we were awkward! Our teas and coffee came with complimentary Christmas cake which we sent home with Audrey as I am certain that no-one under the age of 60 (except Andrew Firth) likes Christmas cake. Saying that, this did look quite appealing as it was light in texture and colour. 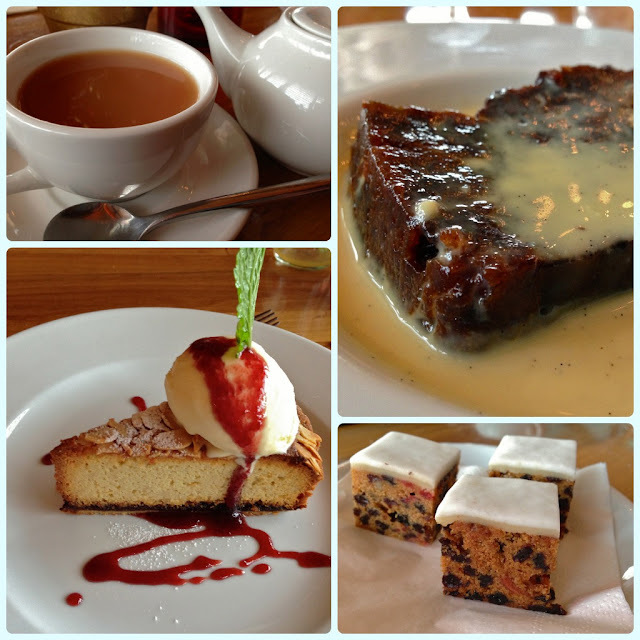 We really enjoyed our little trip to the Cherry Tree and will definitely be making a return visit to sample some more of the menu! We went about a year ago on a Sat December night where we were struggling to get in anywhere and it was really nice. I never went when it was Thatch and Thistle but it's certainly worth a revisit.